Our beds are all about making a relaxing and dream-inspiring environment for your child. 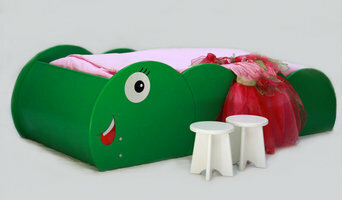 We believe a child's bed should reflect their individual personality and individuality. Quality is at the heart of what we do. We are lucky to have some of the most skilled craftsmen in Northumberland creating in our workshop. We only use the finest materials to produce our sturdy and durable products that your child will enjoy for years to come. Feelgood Designs is a company defined by the principle that good design can have a profound influence on child development, learning and the quality of play. We supply contemporary furniture to create beautiful and stimulating environments for children. Our products are one outcome of the children, spaces, relations research project (Reggio Children, Domus Academy, 1998), made in Italy, and the result of ongoing collaboration between designers, architects and the world-renowned schools at Reggio Emilia. As part of PLAY+projects, we can design and install bespoke equipment for children to your specifications, and provide specialist interiors and architecture services for education and public space projects. What can I expect from good Newcastle upon Tyne, Tyne & Wear nursery designers, children’s decorators or kids’ furniture brands? Nursery designers should also help you understand when style gives way to practicality. Printed nursery wallpaper can make a great design statement but what happens if there is a spillage? Painted walls can be wiped clean and they don’t have to be neutral and bland. Ask about bold, bright colours, make use of fun stencils, or explore kid-friendly chalk paints. Avoid solvent-based paints; opt instead for the water-based variety. Similarly, Newcastle upon Tyne, Tyne & Wear nursery designers will help you to see beyond the fantasy; that decorative bird house might look delightful mounted on the wall but is it an accident waiting to happen? They will ensure you avoid anything that dangles, wobbles, slips or trips. Can Newcastle upon Tyne, Tyne & Wear kids room designers help me with my older child’s bedroom? If your children are a little older then kids room designers in Newcastle upon Tyne, Tyne & Wear can still be very useful, assisting when you are ready to adapt your nursery into a child’s bedroom with a longer shelf life. They will be able to advise on a suitable colour scheme and design that won’t need constant updating as your child grows and can help you choose the right furniture to ensure that the space can be used for sleeping, studying and playing. They will be on hand to suggest the best toy storage solutions, multifunctional fitted study-beds and fun, themed furniture. Need to squeeze more than one child into a single bedroom? No problem, your Newcastle upon Tyne, Tyne & Wear kids room designer will have nifty bunk bed ideas on hand to solve for both storage and personal space issues! If you’re looking for the best Newcastle upon Tyne, Tyne & Wear nursery designers, decorators, children's showrooms and brands, Houzz is the place to start. Browse our Newcastle upon Tyne, Tyne & Wear Kids & Nursery category in the Find a Pro section, and when you see a photo that you like, contact the relevant nursery or kids room designers to see what they can do for you.